The fullness of facial features, skin firmness, and skin elasticity tend to diminish as we age. The average adult loses at least 1 teaspoon of facial fat per year which contributes to a hollower, older appearance. Environmental and behavioral factors, like sun exposure and smoking, contribute to these changes. If your features aren’t as youthful, firm, or full as you would like, Restylane® and Restylane® Lift may be able to help. 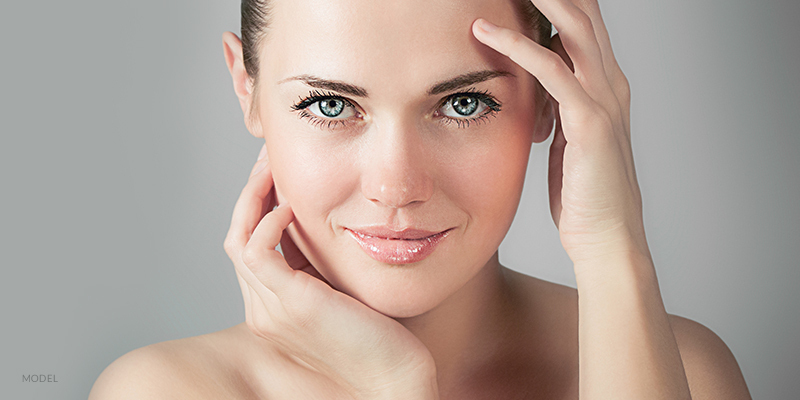 A non-surgical, injectable facial filler, Restylane helps to supplement the hyaluronic acid in your skin. It also adds volume in areas of need and reduces the appearance of facial wrinkles and folds. As a board-certified plastic surgeon that has spent more than 15 years in practice, Dr. Michael J. Brucker offers a wealth of knowledge about aesthetic treatments. His experience with fillers such as Restylane® and Restylane Lyft® helps La Jolla patients achieve youthful, natural-looking features. Personalized, attentive care, and exceptional outcomes are hallmarks of his work. Correct moderate-to-severe facial wrinkles and folds, such as nasolabial folds (also known as “smile lines” or “laugh lines”). Lips become thinner as we age. Restylane® can add volume to lips for overall fullness and/or more definition around the vermillion border. Add volume to the cheeks for a softer and more youthful contour. Give the face a smoother and overall younger appearance. La Jolla patients who receive Restylane® and Restylane Lyft® see fullness and lift immediately. Depending on the areas he treats, the effects should last 3 to 12 months. On average, cheeks treated with Restylane will remain that way for up to a year while wrinkles and folds will be diminished in appearance for about 3 to 6 months. Patients can, and often do, opt for subsequent treatments to maintain the results they have achieved with Restylane. In your initial consultation with Dr. Brucker, he will conduct a comprehensive examination of your skin and features and review the different treatment options available. If you are a good candidate for Restylane or Restylane Lyft, he will describe how the treatment works, discuss what you can expect from your results, and answer any questions you have. Dr. Brucker likes to use Restylane® or Restylane Lyft® to fill in deeper lines and wrinkles or the hollows under the eyes. Specifically, he uses the filler to target the nasolabial folds (the lines around the nose and mouth, also knows as “parentheses”), the anterior jawline as it transitions into the pre-jowling area (near the mouth and chin) and the nasolabial folds. Restylane Lyft® has a more robust hyaluronic acid structure than some other facial fillers. This design helps it last longer in certain areas that need more support, which tend to get more use and experience more wear. As with other injectable fillers, Dr. Brucker will apply his expertise in adding volume to features and contouring the face in a natural and attractive way. The process is a non-invasive experience that requires very little downtime, which makes it an excellent option for patients in La Jolla who want improvement but who aren’t ready for a more involved procedure. Dr. Brucker will desensitize the areas of treatment using ice or a skin-numbing medication if you prefer. The product itself has a numbing agent mixed in to it so most patients find the treatment very tolerable with very little to no discomfort. He will use very small needles to administer Restylane injections in targeted locations. He will evaluate the changes that the gel is making as he treats each site, adding volume and reducing the appearance of wrinkles as he introduces the product. You should be able to return to normal daily activities after treatment, though you may experience some minor swelling and bruising at the injection sites. It is advisable to avoid aspirin and ibuprofen and other blood thinners for at least 10 to 14 days before your treatment to reduce the likelihood of bruising. You should see some of the benefits of your treatment immediately, but the best results usually appear once the swelling has subsided in a week or so. At that point, you will be able to enjoy a refreshed, natural appearance and more youthful, fuller features. Restylane ® and Restylane Lyft ® injections provide La Jolla patients with a well-established, non-surgical option for combatting the signs of aging. Learn more by scheduling an appointment with Dr. Brucker online or by phone at 858-707-7517.